We were open to flash fiction submissions (stories of 1,000 words or less) last month. We received 567 stories and accepted 17, an acceptance rate just a hair under 3 percent. The stories run the gamut of genres, with an especially healthy dose of fairy tales. This was also our first submissions period in which we asked submitters to take a quick, anonymous, 100% voluntary survey in which we asked people’s race and ethnicity. This is part of our effort in the wake of our #BlackSpecFic report to get a better understanding of who is submitting to Fireside, so we can continue working on our mission of inclusivity. Of the 567 submitters, 488 people responded to the survey, or 86 percent. While this is not a scientific survey and we cannot verify the responses, we’re very happy that so many people participated as we feel it gives us a solid look at the submissions pool for the period. There were only a few jackass responses, including “I am uncomfortable with this- I see all humanity as one race, with genetic differentials that aid in adapting to environmental conditions” and “Officially old” and “Human”. If you’re interested in digging in deeper, the full spreadsheet of responses can be found here. This is just one data point. We’ll be collecting the same information on all of our submissions periods for the forseeable future, and we’ll continue to post the results. Dawn Bonanno suffers from an obsession with pens, paper and fixing things, so it only makes sense that she writes stories. She wrote her first story at the age of six on the back of Eastern Airlines luggage tags and has been writing ever since. Rumor has it she doesn’t know how to stop. When she isn’t torturing characters, you’ll find her cooking, baking, running, cycling and spending time with her family. When her feline overlords allow, she blogs about her writing journey at www.dmbonanno.com. Christopher Butera was born in Chicago, Illinois. Previously published works include Static Movement’s Summer Thrills Anthology, Rotting Tales: A Zombie Anthology, and a nearly unseen webisode of SyFy Television’s Helix. He is currently enrolled in City, University of London’s Creative Writing and Publishing MA program working on his second novel. Karl Dandenell is a first-generation Swedish American, survivor of Viable Paradise XVI, and active member of the Science Fiction Writers of America. He lives on an island near San Francisco with his family and 2 cat overlords. He is fond of strong tea and single-malt scotch. When not sitting in project meetings, he reads a lot of speculative fiction, and serves as a First Reader for The Magazine of Fantasy & Science Fiction. Courtney Floyd spent the first twenty-four years of her life living on the borders of the underworld, where she learned to write in between tarantula turf wars and apocalyptic dust storms. She now lives in Oregon with her husband, her hellhound, and an ancient cat whose skeleton she plans to articulate when it passes on to that great big paper bag in the sky. When she’s not writing fiction, she’s working on her Ph.D. dissertation or teaching college freshmen how to write argumentative essays. Find her at synonymsandsuch.com or follow her on Twitter: @cannfloyd. Kevin Hearne is the NYT bestselling author of the Iron Druid Chronicles. He lives in Colorado with his wife, son, and doggies. He hugs trees, rocks out to heavy metal, and will happily geek out over comic books with you. He also thinks tacos are a pretty nifty idea. Allison Mulder grew up in various small Midwestern towns and a sizable swath of the internet. She writes fantasy, science fiction, and–often by accident–horror. Her fiction has appeared in Crossed Genres, InterGalactic Medicine Show, and Escape Pod. With patience, sensitive equipment, and ample provisions, you can sometimes glimpse Allison at allisonmulder.wordpress.com. Or, track her far more easily on Twitter at @AMulderWrites, where she broadcasts any significant life happenings, gushes over her current fictional obsessions, and uses far too many X-Files gifs. Tariro Ndoro obtained her Master’s degree in Creative Writing from Rhodes University in 2016. Her poetry has appeared in numerous journals and anthologies including Kotaz, Oxford Poetry and New Contrast; and her fiction has been featured in AFREADA. Tariro currently lives in Harare, where she’s trying to validate the copious amount of time she spends reading by writing something every now and then. She can be stalked at tarirondoro.wordpress.com. 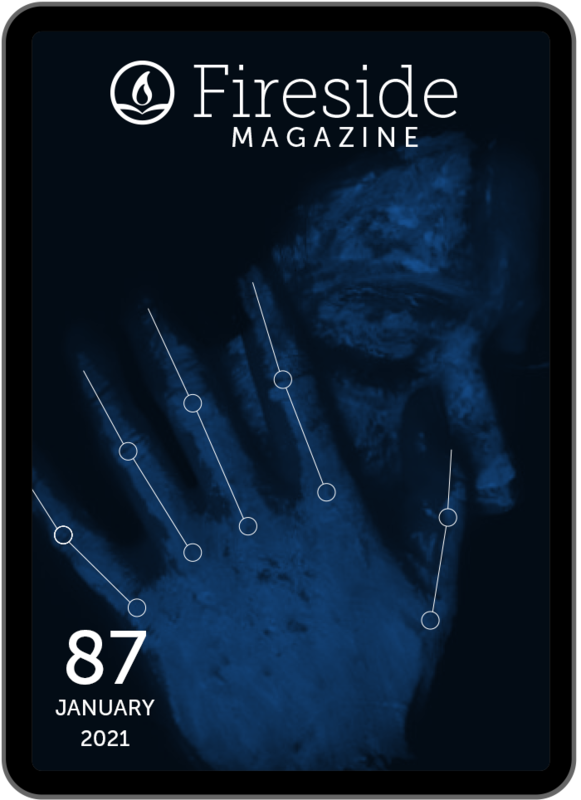 Mari Ness has published fiction and poetry in Tor.com, Clarkesworld, Lightspeed, Daily Science Fiction, Apex, Uncanny, Strange Horizons, and many more, including a previous story here at Fireside. Her poetry novella, Through Immortal Shadows Singing, was recently released by Papaveria Press. She lives in central Florida, where she keeps a careful eye out for magic. Russell Nichols is a spec-fic writer and endangered journalist from Richmond, CA. His story about a black vampire on trial in Boston was included in the Best of Apex Magazine: Volume 1. Find his work in Terraform, Fiyah Lit Mag, Nightmare Magazine’s POC Destroy Horror special issue and other anthologies. He left the States in 2011 to wander the world, living out of a backpack with his wife. Look for him at russellnichols.com. Suyi Davies Okungbowa writes crime and speculative fiction from Lagos, Nigeria. His fiction has been published in Lightspeed, Mothership Zeta, The Dark, Omenana, Lights Out: Resurrection (anthology) and A World of Horror (forthcoming anthology), amongst other places. He is a charter member of the African Speculative Fiction Society. When he’s not writing, Suyi works in visual communications. In-between, he plays piano, guitar, FIFA, and searches for spaces to fit new bookshelves. He lives on the web at suyidavies.com and tweets at @IAmSuyiDavies. Cherrelle Shelton grew up in New Jersey where she currently resides with her husband and three children. She has a Master’s degree in Public Health and works in Environmental Health. She is the author of several children’s books as well as a young adult novel, Dreamers. Find her at www.ItsReallyRelle.com. R. D. Sullivan lives in Northern California with her family and two very bad dogs, where she runs a subcontracting business. Beyond fiction, she likes to spend her time performing stand-up and producing short films. R.D.’s grandmother would like you that all of R.D.’s talent comes from her. John (@wiswell) lives where New York keeps all its trees. He’s previously appeared at Fireside with ‘Bones at the Door,’ and he has a new Horror story coming soon to Pseudopod. He intends to donate his body to medical science, which will make romantic apocalypses harder on him. Caroline M. Yoachim lives in Seattle and loves cold cloudy weather. She is the author of dozens of short stories, appearing in Fantasy & Science Fiction, Clarkesworld, Asimov’s, and Lightspeed, among other places. Her debut short story collection, Seven Wonders of a Once and Future World & Other Stories, came out with Fairwood Press in August 2016. For more about Caroline, check out her website at http://carolineyoachim.com.